While planting apple seeds with kids is fun and will produce a tree, it's important to know that the tree may never bear fruit. Most apple trees that are grown for fruit are produced by a grafting method. Additionally, an apple tree grown from seed that does bear fruit can take up to eight years to get to that stage. Finally, it may produce apples that don't look or taste like the apple from which the original seed came! That said, planting apple seeds with kids is a great learning experience. Allow the child to pick out and eat an apple, making sure to save the seeds from the core area. It's not a bad idea to eat several varieties, because some apple seeds germinate more quickly than others. Remove as many seeds as you can from the core. Only use intact seeds, as broken ones will not grow. 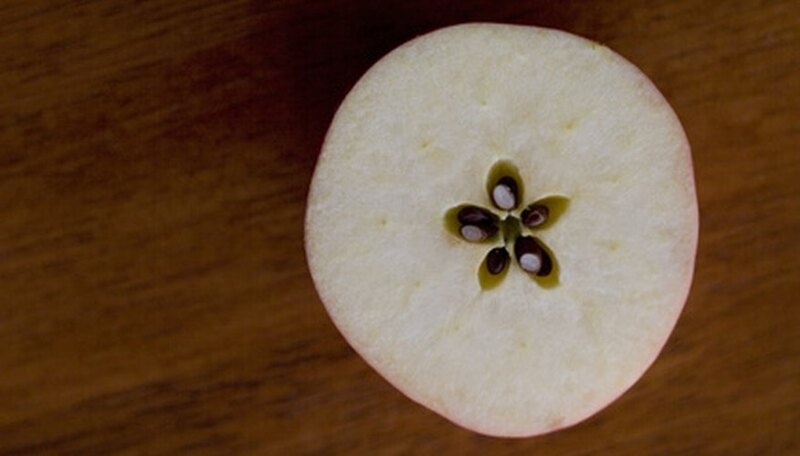 Clean the seeds carefully with warm water, making sure to remove any parts of the apple that cling to them. Allow the seeds dry out for at least three days. It's best to put the seeds on a paper plate. Help keep track of what type of seeds you are handling by having the child write the name of the apple they came from on the plate. Make sure to put the seed plates in a protected and out-of-the-way place, so that no critters or children carry them off. Dampen a paper towel and place the seeds on it. Fold the wet towel over several times so that the seeds are surrounded in moisture. Place the paper towel in a plastic sandwich bag and seal it; then place the entire bag in the refrigerator. Have the child check the seeds daily. They should sprout within one to two weeks. Make sure they are a good size and sturdy before moving to the planting stage. Use a push pin to poke holes in the bottom of several paper cups. Fill each cup about 3/4 of the way with potting soil. Transfer the apple seeds to the cups, planting one seed per cup. Make sure the green sprouted part is above the soil. Water gently until the soil is very moist and place the cups in a sunny location. Water the seedlings daily and make certain that they receive lots of sunlight. As they start to outgrow their containers, transfer them to larger clay pots and move them outside into a spot that receives lots of sun. Continue to water daily. Transplant the trees into the ground when they are about 12 inches tall and have developed a sturdy root system. Have the child help you dig a hole in an area of the garden that receives at least six hours of sunlight each day. The planting hole should be twice the size of the tree's root ball and filled with planting soil and manure. Place pine straw around the base of the tree to help keep moisture in the soil. Continue to water it well, especially during the hot months, and enjoy it as it grows. Have the child draw or paint the words "apple tree" on the back of the bowl area of a short wooden kitchen spoon. Then, spray the spoon with a clear sealant and place it at the base of the tree as a garden marker. In order to coax fruit from your apple tree, learn to prune it correctly and fertilize it regularly.